If you are looking for designer lucknowi chikankari Anarkali in pure georgette fabric with heavy Muqaish, Kamdani and Badla work or heavy chikankari embroidery, you can buy from dress365days.com they have huge collection of heavy chikankari embroidery apparel . 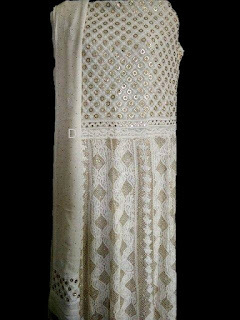 Designer and heavy Badla Yoke chikankari anarkali women buy either for wedding or some party functions etc. Since the fabric used is pure georgette these can be easily dyed in the colour of your choice. Order your pure georgette chikankari anarkali from dress365days.com, they have their workshop in Lucknow and provide extremely good quality product. Majority of their pure georgette gotapatti and muqaish work get exported to USA, Australia, Singapore, Dubai , Middle East , Pakistan and UK. You can see some samples of Dress365days yoke gota patti anarkali .